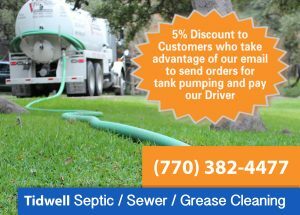 The only way to keep your septic tank system functioning properly is to have the tank solids pumped by a local pumping service. While the need for pumping depends on size, usage and wastes added, it is recommended by many local health authorities and the Environmental Protection Agency that a system be pumped every 3 to 5 years. While the pumping frequency may vary, every septic tank should be pumped every 5 to 7 years maximum. Failure to maintain a regular pumping schedule, or the use of additives can cause more solids to pass through the septic tank increasing the likelihood of drainfield failure. It is only during a pumpout that the septic tank can be inspected for possible leaks and the baffles inspected. These are the only things that generally go wrong with a septic tank itself. If either of these fail, it is a serious problem that must be addressed immediately. The baffles help prevent grease, oils, and solids from passing through the septic tank to the drainfield. The inlet and outlet baffle can only be inspected during a cleanout. If the baffles are damaged in any way, they must be replaced immediately. The is less costly than drainfield replacement. The most common Septic System Care program consists of pumping the tank every few years and then the system is forgotten about. This pattern can continue for many years, however, there will come a time that your system will need serious attention and costly replacement. Septic Systems fail when when the absorption field no longer accepts and filters the drain water from your home. The septic tank, which is designed to separate and decompose the solid waste from the homes drain water, overflows with excess water and waste when the absorption field not longer accepts water. The result is smelly septic gasses; slow running drains, soggy lawn and frequent pumping of the septic tank. We are all guilty of abusing our septic tank at some point in time. It may range from excessive water usage, failure to repair a leaky faucet, or dumping some hazardous solvents or liquids down the drain. A simple rule is “ If you cannot eat it, then it probably will be damaging or difficult for your septic system to process”! The septic tank has not been pumped out in the past 5 years. Even if the system appears to be working well, sludge may have built up to the point where waste water is released without sufficient time in the tank for treatment and settling of particles. This situation may result in pollution of groundwater or cause eventual clogging of the drainfield. A wet area or standing water occurs above the drainfield. This situation can develop when sludge particles clog the drainfield, when tree roots or broken pipes keep waste water from dispersing through the entire drainfield or when water use in the house exceeds the design capacity of the system. Toilets run slowly or backup; in the worst cases, the basement is flooded with sewage. Septic odors occur in the house, above the tank and drainfield or escape from the vent pipe. If the system is operating properly, there should be no odors. If there are odors this is an early sign of failure. Your wastewater treatment system is not a substitute for the trash can or compost. Dispose of tissues, diapers, baby wipes, sanitary napkins, tampons, condoms, cigarette butts and other solid waste with regular garbage and not down the toilet. Chemical Products advertised to “sweeten” or improve your septic tank system operation cannot replace routine pumping and may even be harmful. Additives containing solvents to unclog your system can kill the microbes needed to digest wastes in your septic tank and drainfield.